There is nothing quite like the comfort of a glowing campfire. Now you can safely bring the campfire home and incorporate it into your backyard landscape. 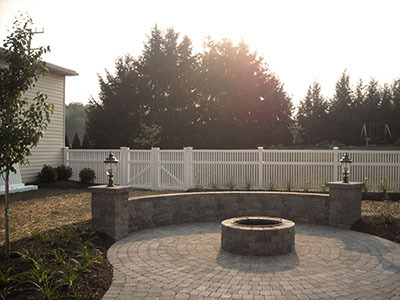 Fire pits are built on a level base with retaining wall blocks in a circular or square kit and include an insert. Some enjoy the natural wood smoke and burning embers that emulate favorite past times sitting around a campfire, while others appreciate the smoke-free advantage and instant on/off switch of a gas fire pit. As a new focal point surrounded with a seat-wall and patio or an accent to your existing landscape, fire pits are an affordable way to add a style and memories to your backyard. 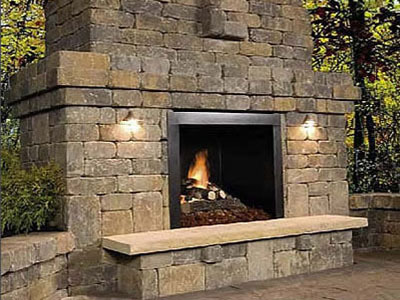 Blooming Valley is also experienced in constructing beautiful outdoor fire places which can be attached to a garage or your home, or stand alone to draw your outdoor space together. Outdoor fire places are statement pieces with true class to be enjoyed by family and friends for generations.